After vanquishing England 5-0 next on the agenda for the Australian Test team is the world number one, South Africa. The three-Test series kicks off at Centurion on 12 February followed by matches at Port Elizabeth and Cape Town. Watching England disintegrate was painful, akin to observing an autopsy on a man who is still alive. The Proteas will not yield as simply at that. The respective pace attacks look comparable which is a strange thing to say given South Africa boasts the top-two ranked bowlers in the world – Vernon Philander and Dale Steyn. However the form displayed in unison by Mitchell Johnson, Ryan Harris and Peter Siddle in dismembering England was as clinical and effective as you would ever see. One area where the tourists will hold a distinct advantage is the spinning department with Nathan Lyon noticeably improving with every outing – he claimed 19 wickets at 29 against England. South Africa started its recent two-Test homes series against India with leg-spinner Imran Tahir as the preferred slow bowler before replacing him with left-arm finger spinner Robin Petersen. If Australia’s bowlers can fire as they did during the Ashes the chances of an Australian victory will go up astronomically. There were signs during his devastating return against England of Johnson bending the ball back in the air towards the right-handers, a skill he first displayed on the tour of South Africa in early-2009 – although he lost it soon after. His sheer pace and aggression will test any of the Proteas’ batsmen if he gets favourable conditions. The Australian bowlers executed their game plans superbly against each of the England batsmen and never let any of the off the hook – often the concerted pressure brought about wickets. 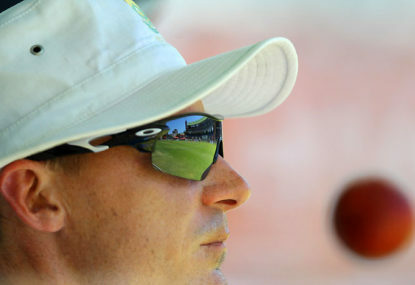 In South Africa they will face batsmen with very differing techniques – Graeme Smith’s on-side dominance predicated on a strong bottom hand; Hashim Amla’s wristy clips through the onside and a devastating cut shot; A B de Villiers’ counter-attacking attitude and Faf du Plessis’s broad bat defence. Key to Australia’s hopes will be hitting the right areas consistently and being patient enough to make it a battle of attrition for the batsmen. Ryan Harris (now ranked number three in the world) was outstanding during the Ashes series with 22 wickets at 19 to give him stats of 93 wickets at 21.6 from 21 Tests. He was initially planning to have surgery on his troublesome knee following the England series but has now put it on hold until he returns from the South African campaign. It is crucial to Australia’s prospects that his body holds up for all three Tests. While the bowling attacks look comparable given recent the batting is a different story thanks in the main to Australia’s top-order inconsistencies. Like the bowling, the Proteas boast the top-ranked batsman in the world in de Villiers while Amla has recently slipped to number four – both men boast career averages in the fifties – with Smith at number ten. Any one of those, if given sufficient latitude, can win a match off their own bat. One area that South Africa will be forced to fill is the massive hole left by Jacques Kallis who has been a fixture at number four for over 15 years. His absence is a triple blow to Smith’s team as he was the fourth seamer along with being one of the best slip fieldsmen in the world. His absence throws out the entire balance of the South African team. It will be fascinating to see how the selectors go about filling the void. The Australian top seven – excepting George Bailey, should he be selected in the squad – carries confidence into the series as they all scored at least one century in the Ashes series with Clarke, Chris Rogers, David Warner and Steve Smith doubling up. While they all made triple figure scores during the series the consistency was still a major issue. Too often the likes of Brad Haddin and Smith had to rebuild following top-order collapses. Similar showings against South Africa will largely eradicate any prospect of a series victory as Steyn, Philander and Morne Morkel are likely to provide too greater handful for the tail. It is easier said than done but Australia has to bat for long periods of time. Rogers and Clarke need to be at the forefront in this area. Without Kallis and lacking potency in the spin department much will be asked of the Proteas’ pace trio. With three Tests in the space of three weeks if Australia can force the opposition bowlers to work overtime by prolonging their time at the crease there is the prospect that fatigue may come into account towards the end of the series. During the Ashes series Australia’s fielding was as good as it has ever been with very few cheap runs afforded and the bare minimum of grassed catches. The standard was set behind the stumps where Haddin was in arguably the best form of his career. The Aussies must again maximise their chances given the potency of the Proteas’ batting line-up. The Australian outfit is a happy one under the tutelage of Darren Lehmann and they are playing confident and winning cricket. The series in South Africa will be a litmus test as it will give everyone an indication of just how far this team can go in its quest to regain the coveted number one ranking. Australia can win it if they execute the key moments in matches as they did against England. But they must be wary of collapses while at the batting crease. Recovery from such against Steyn and co is far less likely.